The blends below have been chosen to assist your therapeutic treatments for excess fatigue, energy management and general health and vitality. You are a few clicks away from a new lease of life with more energy and an aid to rest and relaxation. Energising Blend by Peeled Orange helps to restore Strength, Stamina, Concentration and Energy. 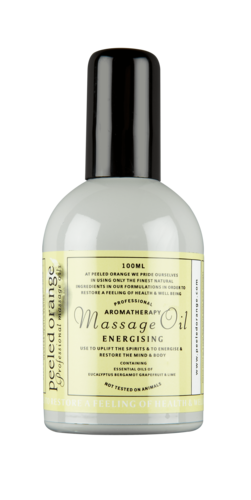 Using highly vibrant oils from the Lime Tree and Eucalyptus Plant, Peeled Orange Energising Massage Oil will help your Therapist to restore Focus, Vitality and Well being. Whether you are feeling low in spirits, depleted due to strenuous activity or are being treated for long term fatigue, please select Peeled Orange Energising blend. Soothing Blend by Peeled Orange contains carefully selected Herbal Oils including Lavender, Cedar Wood and Petitgrain. If you are suffering a lack of energy through loss of sleep, or are currently finding it difficult to rest and relax, your therapist will currently be treating you for these symptoms. 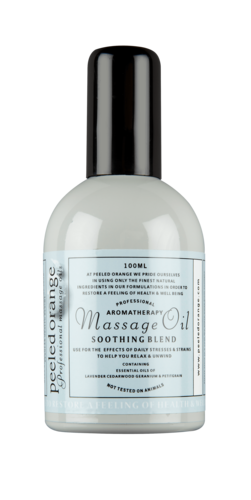 Peeled Orange Soothing Massage Oil will assist any Therapeutic Treatment to ease and relax a tired mind and body, and therefore aid restful sleep.